PARIS (AP) — It was Karl Lagerfeld’s final curtain — even though he wasn’t there. Celebrities, models and fashion industry peers who had gathered at Chanel’s catwalk show Tuesday held a minute’s silence to bid adieu to the iconic couturier, who died last month and did not want a public funeral. Guests wept as his final collection for the Parisian house, co-designed by new artistic director Virginie Viard, was then presented at Paris’ Grand Palais amid a cinematographic set: a mountain village covered in peaceful snow high above the clouds. It was, it could be said, Lagerfeld’s runway in the sky. Stars including Penelope Cruz spoke to The Associated Press to pay tribute to the legend who left an indelible mark on the global fashion industry in a six-decade career. Designer Lagerfeld had made his antipathy for a public funeral clear. 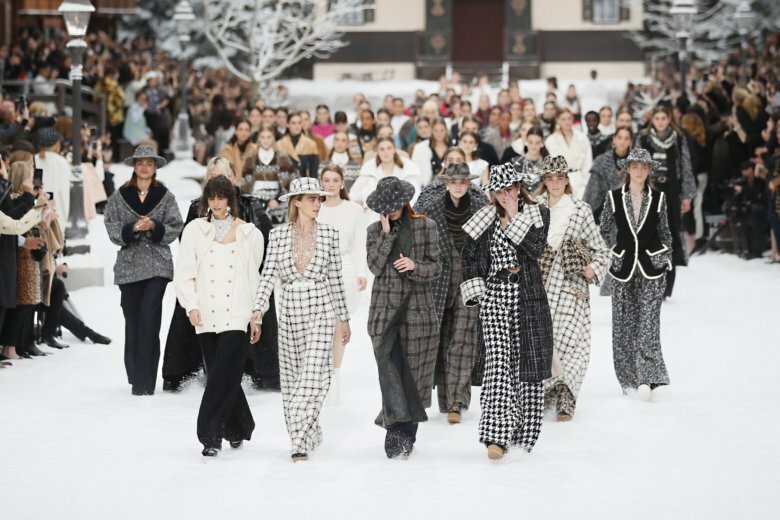 So Chanel’s fall and winter show, the last collection of a couturier that had designed hundreds, was a fitting sendoff. The display featured both genuine emotion and ironic spectacle, Lagerfeld’s trademark. Ahead of the runway show, its models, including Cruz, stood solemnly in the fake snow by an Alpine chalet and resting ski equipment. A gentle bell rang out as poignant recordings of Lagerfeld’s voice boomed out and echoed across the vast venue. Guests including actresses Marion Cotillard and Kristen Stewart, models Claudia Schiffer and Naomi Campbell, singer Janelle Monae and U.S. Vogue Editor Anna Wintour observed a one-minute silence. Many wept. In a moment that perfectly captured Lagerfeld’s universe, the initial silence was interrupted by the bark of a small white dog kept in a sparkling Chanel shopping basket by a front-row guest. It was all about keeping warm, with short ankle boots protected beneath tweed fedoras in looks the house said belonged to “elegant mountain dwellers.” Oversize, woolen statement coats that hung heavily had a distinct historic feel, a mood that Lagerfeld often liked to evoke. It’s perhaps unsurprising: Although Viard has held no official role as designer until now, she is known to have worked closely with the late designer across all of Chanel’s numerous design channels, including couture. It’s too early to tell if Viard will lead the powerhouse in a new direction, but signs are that she won’t. The fact that Chanel chose someone who has worked in exuberant Lagerfeld’s shadow for years indicates it hopes to continue his financially successful vision and approach that catapulted the iconic house from the creative wilderness during the 1980s into the multibillion-dollar powerhouse it is today. Management could have chosen a successor with a big, splashy name — such as Lanvin’s former designer Alber Elbaz, an icon in the industry, who’s currently unemployed. The fact they didn’t speaks volumes. “For me that was a magical moment, walking hand in hand in Central Park at night in winter — hearing his wonderful and funny stories,” she said. Cruz said she will remember the kindness of Lagerfeld, whom she’d dreamt of meeting since being little. She recalled that he took care of her father during a posh Paris dinner. “How kind and respectful he was to my dad, even if they didn’t speak the same language — that always stayed with me,” she told the AP. American singer and songwriter Janelle Monae spoke of her surprise at being given a sketch Lagerfeld had drawn of her during a performance in Russia. Louis Vuitton staged an incredible recreation of one of Paris’ most famous, and controversial, buildings: The Pompidou Center. Guests including actresses Emma Stone, Alicia Vikander and Jennifer Connelly gathered in an annex inside the oldest courtyard of the Louvre and looked around inquisitively as they discovered another Parisian landmark with its famed blue, white, red and green piping. The link between the set and the clothes was somewhat tenuous, save for colorful elements of geometry. Designer Nicolas Ghesquiere said he was, above all, inspired by the spirit of Pompidou’s environs, in the bustling center of Paris. “It’s a fascinating incubator of a neighborhood… I love that impression of a sartorial melting pot,” he said. Many of the 57 tightly fitting styles that riffed on the 80s were cinched by a large square buckle belt at the waist. And though Ghesquiere has earned a reputation for minimalism, this collection simply teemed with bustling detail. Pops of bright color created contrasts in ensembles that emphasized the neck. A series of Mondrian and geometric-print looks evoked paintings exhibited in the Pompidou, which houses France’s National Museum of Modern Art. But they came across a little heavy-handed, delivered in overly bold colors. The diverse collection comprised many beautiful garments, but it was a little hard to pin down. Miuccia Prada was another designer to draw in the stars at the art-infused collection of her little sister brand Miu Miu in Paris. Actors Joel Edgerton and Chloe Sevigny joined “Game of Thrones” star Gwendoline Christie on the front row. A darker mood than normal pervaded the fall-winter designs. Models in sharp black capes or gently sculpted 90s camouflage print paraded beside decor that comprised artwork with screens projecting stark and figurative images of people and contemporary life. This season, Prada adorned the neck with silk bows, ribbons and circular bands of fur in the styles of the 70s. At one moment the dark musing turned to joy: The camouflage print blossomed into a bright set of florals on loose flower-power 70s skirts. It was a clever twist — typical of the atypical designer. This story has been corrected to fix the spelling of Janelle Monae’s surname.